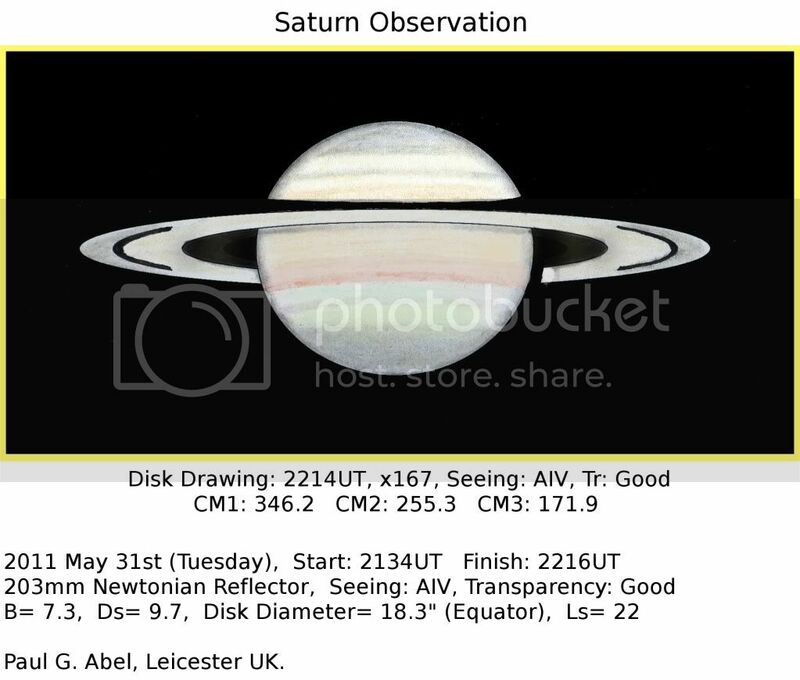 Greetings all,I just thought I'd share a Saturn drawing with you that I made last night- it doesn't show very much I'm afraid as the seeing was rather poor, still I found the colours rather striking.Best wishes,-Paul. Interesting. I don't recollect ever having seen or percived the EB or the Tr zones/bands in any shade of red this apparition. To me they always look some shade of yellow or cream colour.Andrea T.
I have observed a broadish pinkish/orangish belt in the northern hemisphere on 2 occasions this apparition: faintly on the 27th. February (AII/III T4/5); and easily discernable and more orange on 7th. April (AIII T4/5).I am unsure whether the belt was the NEB or NTB. It seemed rather far N for the NEB but too broad to be an NTB. Whoops! Forgot to say that Paul's drawing is a good representation of the belt I observed in terms of colour, position and breadth.